I’ve been slowly going through my older recipes and converting a few of my favorite recipes for the Instant Pot. 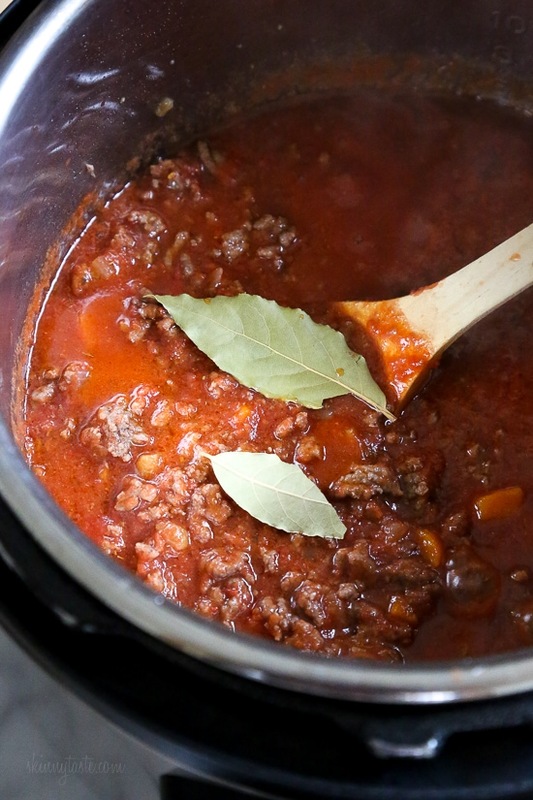 I also have a Slow Cooker Bolognese recipe and stove top here if you prefer. 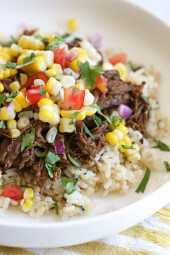 I’ve had my Instant Pot which is basically an electric pressure cooker way before it became so popular and have tons of recipes, to see more Instant Pot Recipes, click here. If there are any new recipes you would like to see in the Instant Pot, let me know! You can serve this over pasta, or swap the carbs for veggies and serve it over roasted spaghetti squash, butternut squash noodles (so good!) or zoodles. Yummy… topped gnocchi for lunch and fettuccine for dinner. I’m single so I opted for one pound of beef and one can of tomatoes. 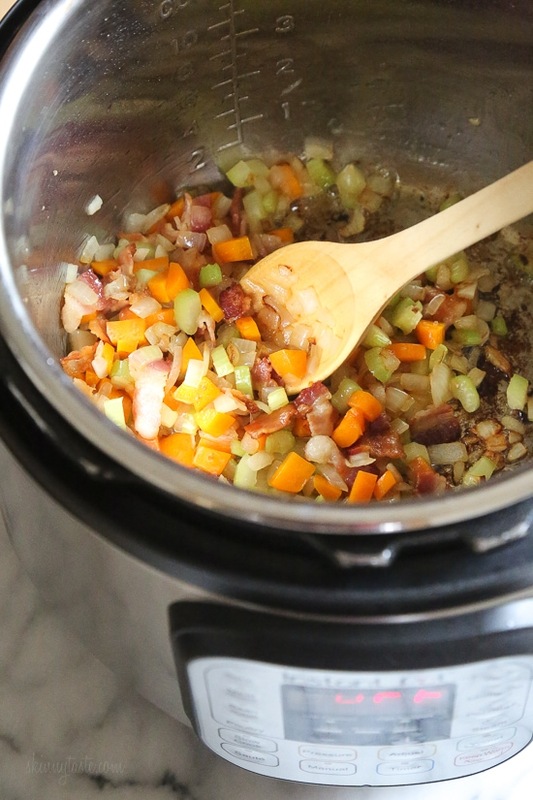 For whatever reason I couldn’t find fresh celery so I got a frozen mirepoix mix which made this super easy! Skipped the wine and cream because I didn’t have any wine and the other comments said the cream wasn’t needed. Will play around with spices because I like a little more kick. 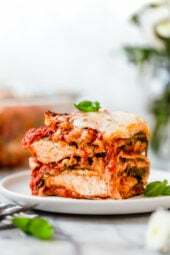 Solid recipe! This is our favorite sauce but now we are faced with the challenge of having two boys with type 1 diabetes and thus need to find an accurate carb content in everything we make. When I make this recipe the only change I make is that we do 1 lb italian sausage instead of pancetta. I already calculated that difference. My only concern now is that it says 1/2 cup serving size with 10 total servings and I feel like what we end up with is far more than 5 total cups. Obviously the 16 oz sausage vs 4 oz pancetta makes up some of that difference, but it still doesn’t seem right. Does anyone else get a much larger yield than 5 total cups from this recipe? I’ve noticed the recipe doesn’t call for draining of the grease from the meat. Is that correct? Made this for the first time tonight. I got the burn message as others did. I quickly added about 1/2 c of water and re-started it – be sure to add at least that much before starting to pressure cook. 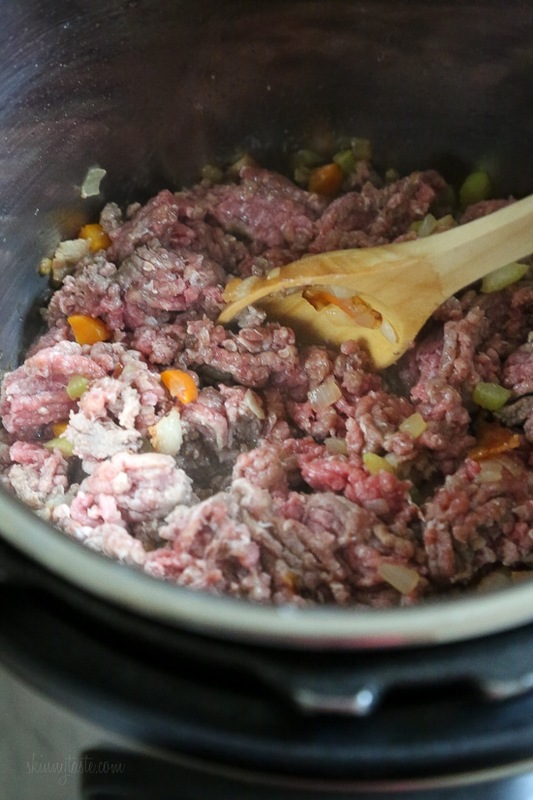 I also suggest adding some minced garlic right before adding the beef. I did about 1/3 c of wine instead of 1/4. I also added some italian seasoning while the beef was browning. Because of the delay with the burn message, my family was ravenous, so I did quick release instead of natural. My husband said it was “very” good, and he reserves that verbiage for amazing meals. My picky toddler scarfed it! I have to admit, I loved it too! Will prob double the bacon, toss in some mushrooms, and add more wine next time! Bón appetít! Great Bolognese recipe. Simple and absolutely delicious. Made this for a few friends and they LOVED it. We put it over spaghetti squash. I have an 8 quart insta pot can I double this recipe in it? Same thing happened to me. 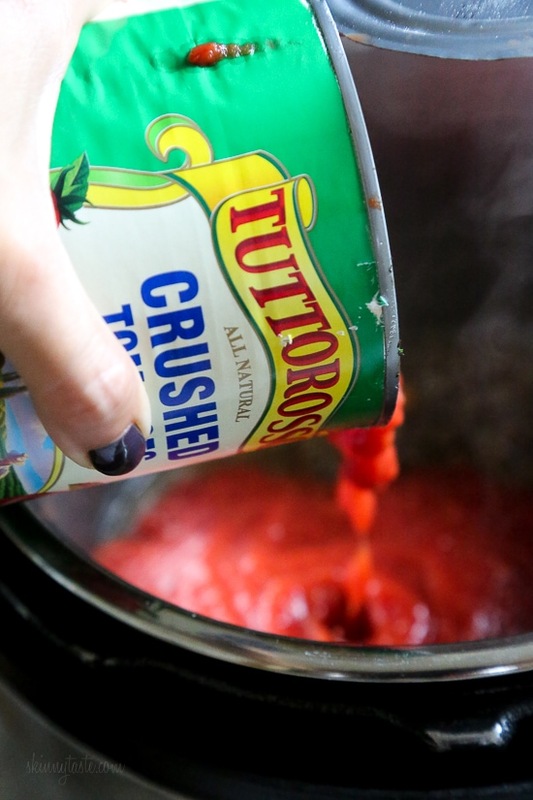 I’ll try it one more time using crushed tomatoes. Where is this version 7SP when the crockpot version is 3SP? At a quick glance, I don’t see any difference. I would rather spend 3SP than 7 any day. 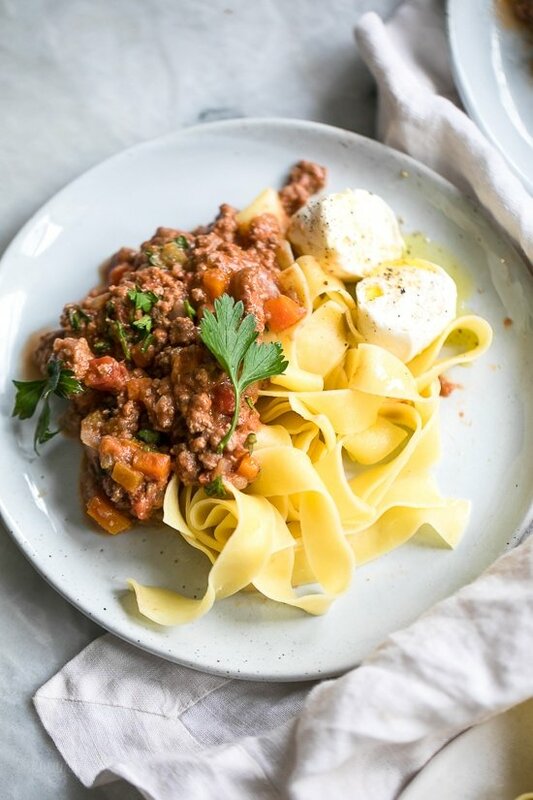 This bolognese BLEW ME AWAY. 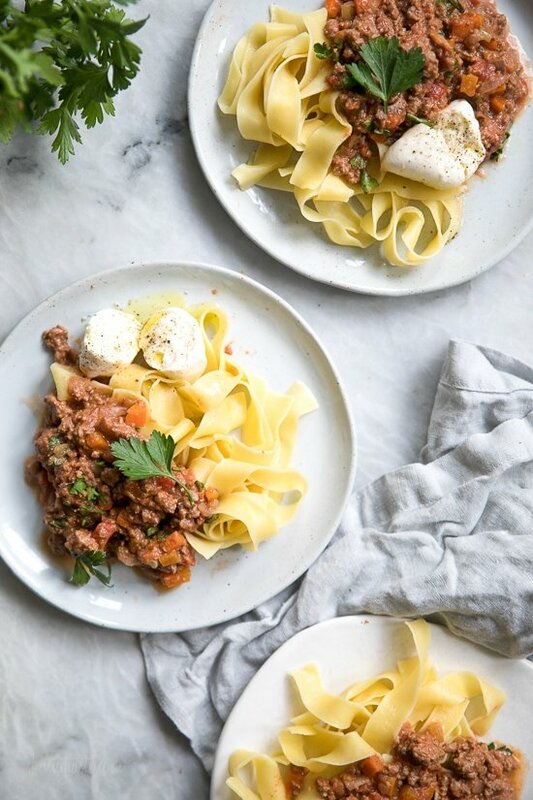 Honestly I didn’t think bolognese could ever be ‘noteworthy’ but wanted to test something low-risk in my new instant pot. I knew I was in for a treat when I opened the lid after venting. Seriously, so good. Love everything I’ve made from Skinnytaste!PS I didn’t have half and half so I used 1 part heavy cream and 2 parts almond milk to make up the same volume and it worked well! Delicious! I think the WW FP count is wrong but it’s good either way! I read the newer models have this burn notice when the pot is too hot, my guess let it cool, then turn on. I keep getting the SAME notice on all of these IP recipes from SkinnyTaste. The newest models are too sensitive for these recipes. Disappointed that it kind of makes my SkinnyTaste IP recipes useless. Please note: The newer IP models have a hair trigger burn sensor that can’t tell the difference between a slight caramelized residue, which is good, and totally burnt. To avoid this, when using the saute button always deglaze the pot after sauteeing with a tablespoon or two of water or broth before adding your other ingredients. Also, if you didn’t use enough fat when sauteing the veg and the bottom gets brown, make sure to deglaze with the wine and scrape all the bits off of the bottom. This was really good. There a couple of errors in the recipe. Step 3 and 5 both have instructions to add 3/4 teaspoon of salt and ground pepper. Also for the ingredients it says 1/2 tsp of salt. I just added 3/4 tsp of salt one time and it was good. I really love all of your recipes. Thank You!! I’m not sure what you would have done, but these recipe isn’t remotely bland. Maybe try following as written. I’ve made this several times for multiple different people and they go nuts for it. Can you explain why this is natural release? Thanks! 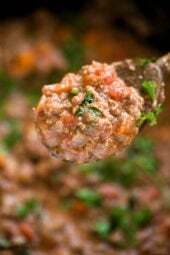 Has anyone replaced the beef with ground lamb? If so, did you change the seasoning? If I wanted to add mushrooms, should I add them before or after cooking the sauce? I LOVE mushrooms! Quick question: this looks identical to the crock pot version but you list the points for the crock pot at 3 FSP but this is 7 FSP. What is the difference? Hoping this one is wrong and it’s 3 LOL! I just added it to the recipe builder & came up with 3 FSP per this recipe. Whoops! I meant 4 FSP! Sorry!